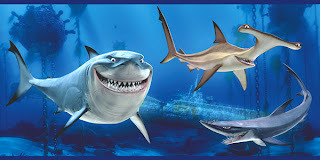 Kingsisle is having a Shark Week this week on both games Wizard101 and Pirate101. This means you get to learn extra facts about sharks and you get a free 7 day Rental Mount on both games. With Wizard101 you'll get a 7 Day Rental Swift Shark and with Pirate101 you'll get a 7 day Rental Hammerhead Mount! This is pretty awesome. I just redeemed my code. You can redeem your code(s) on the Wizard101 Website or Pirate101 Website to earn both of your code. This is going to be a great shark week! To learn more information about shark week, click on the shark picture on the top right corner. :D Happy Shark Week!